The Gorkha Janmukti Morcha, which had since 2012 been clamouring for an amendment of Article 243M of the Indian Constitution for implementing a three-tier panchayat system in the hills today changed track and said it would consult the state and the Centre to hold the three-tier election without amending the Constitution. In 1993, Article 243M was amended and following the section 3 (b) was added stating that "nothing in this Part... relating to panchayats at the district level shall apply in the hill areas of the district of Darjeeling in the State of West Bengal for which Darjeeling Gorkha Hill Council exists under any law for the time being in force. 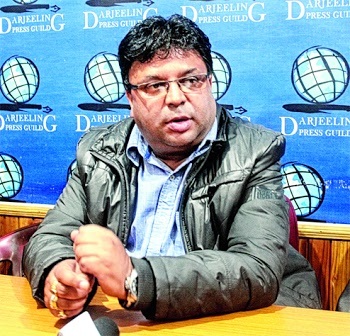 Shall be construed to affect the functions and powers of the Darjeeling Gorkha Hill Council constituted under such law". The Morcha, the state and the Centre has been stating that because of this amendment, only two-tier panchayat elections can be held in the hills. The Morcha had been demanding that this section should be amended by the Centre to pave way for a three-tier panchayat system. With the state government preparing ground to hold a two-tier panchayat system election, the Morcha today said it was exploring possibilities of holding a three-tier election without amending this clause. Observes believe that the Morcha wants a three-tier system at any cost to ensure that there is no loss of face to the party. Elections to panchayat, that too only for gram panchayats were held in 2000 in the hills. "We are closely studying the West Bengal Panchayat Act, 1973, and the GTA Act and believe that it might be possible to hold a three-tier election without amending the Constitution. We will write to the government (state and Centre) to explore the provisions of the 1973 panchayat act and the GTA act," said Roshan Giri, general secretary of the Morcha. When asked why this sudden U-turn, Giri said: "Earlier the government was stating that Article 243M has to be amended. We are trying to bring to their notice that the panchayat and the GTA act has stated otherwise." The Morcha claims that Section 185A, had abolished the zilla parishad until the DGHC exists. "However, since the DGHC has been repealed under Section 74 of the GTA act, the zilla parishad can be brought back into place as per the West Bengal Panchayat Act, 1973," Giri said. Article Section 185A, Section B of the 1973 panchayat act state: "All rules, orders, bylaws, notifications made or issued from time to time under provisions... of this Act, applicable to Zilla Parishad, and continuing in force immediately before coming into office of the council, shall, after such coming into office, continue in force so far as they are not inconsistent with the provision of the Darjeeling Gorkha Hill Council Act, 1988, until they are repealed or amended." Giri said: "The zilla parishad was dissolved till the DGHC existed and was not repealed. Since the DGHC has been repealed now, we believe that the zilla parishad can be revived." The Morcha leader said the GTA Act Section 34 mentioned: "Notwithstanding the provisions of West Bengal Panchayat Act, 1973, the Gorkhaland Territorial Administration shall exercise general powers of supervision over the zilla parishad, panchayat samitis, gram panchayat...."